He might ride for the French lottery, he might have a four-leafed clover on his jersey but yesterday Thibaut Pinot didn’t get lucky. Instead his stage win was clever tactics coupled with strong riding rather than a breakaway finally beating the odds. I’ve tipped him on here and it seems even Team Sky are watching him closely. Just 22 years old and from the Vosges area of France, close to the river Rhine and beyond, Germany. It’s a land of forested hills, gurgling rivers, quiet roads and cold winters and you might have seen the place in glorious summer during Stage 7 when the finished tackled “his” climb of the Planche des Belles Fille, the climb frequently used to test himself in training rides. He finished an honourable 15th but obviously wanted more. He responded with a stage win. He wasn’t even supposed to ride the Tour. Arnold Jeannesson was injured so he took the place but even this wasn’t an obvious choice for team manager Marc Madiot. The plan was to get him in the Vuelta where the climbing suited him more but he was showing in the recent Tour of Switzerland he could climb with the best, although an illness took him out of this race. He’s been impressing since the Tour de Romandie in 2010 when he took the mountains jersey as a neo-pro. I’ve long kept an eye on Pinot, tipping him in the winter as a rider to watch for 2011 and he didn’t disappoint last year with some strong climbing in the Dauphiné where he could hang with the front group and he won the Settimana Ciclistica Lombarda stage race in Italy, neutralising numerous Italian attacks after he’d taken the overall lead early in the race. He’s keen on Italy, he wants to win the Tour of Lombardy one day and his arm is tatoeed with solo la vittoria è bella, Italian for “only victory is beautiful”. He’s from a cycling family, his father was a modest regional rider. Look at him on the bike and you can spot the DNA as to why he rides so fast, the lean limbs, a narrow waist and a large thorax that presumably contains giant lungs. Older brother Julien Pinot was an elite rider knocking on the door of the pro ranks before being diagnosed with a heart condition. 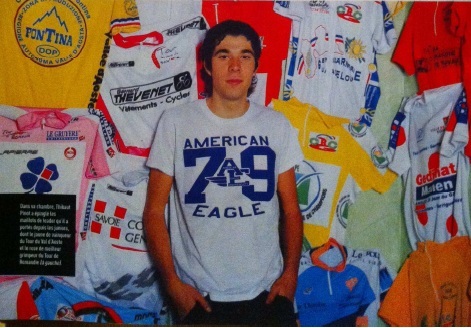 Whilst Julien had to step down from the Espoirs scene, kid brother Thibaut started racking up results as a junior. Older brother started coaching the younger one, with Julien heading to university to study sports science and also becoming the coach of crack French amateur squad CC Etupes, from the town of Etupes. This was the team for Thibaut’s first and only year in the amateur ranks at senior level. He proved to be one of the best amateur riders in Europe in 2009, notably winning the six day Giro Ciclistico Valle d’Aosta, a mountainous stage race with an international field, becoming the youngest rider to do achieve this too. The mention of elder brother Julien Pinot isn’t just a side story, he is doing a thesis under the guidance of Frédéric Grappe, the sports science advisor of pro team FDJ and now coaches the pro team too. More so since he’s adept at modern training, unlike many peers in France, Pinot’s been using an SRM power meter from the early days, backed up by frequent effort tests in the lab. After attending FDJ training camps in 2009, he turned pro for 2010 with FDJ. He started at the deep end in his first year as a pro, with the Tour Down Under and then 65 days of racing, including several Pro Tour stage races. No grand tour but no surprise there since he was the youngest rider in a Pro Tour squad for 2010. “His greatest asset is his power of recovery” Julien told Vélo Magazine, adding “and his mental strength too“. Those strengths come in handy. First, because Pinot sees himself as a stage racer – albeit with a predilection for the Tour of Lombardy – and the mental side is crucial. He’s already assumed the status of team leader in races before, for example the 2011 Dauphiné. He’s also been improving his nerves to stay at the front of the bunch. This cost him in 2011 when he got distanced during the Dauphiné on a flat stage but there few excuses, instead a resolve to fix things. FDJ fell out of the World Tour in 2011 and no wild card appeared for the Vuelta so the Tour is his first grand tour. Word is the cold builds up a big appetite and he enjoys dishes like fondu and raclette, non-pro dishes involving melted cheese. But there’s part of him that’s Parisian too, he’s a big soccer fan and supporter of Paris St Germain, the top league team from the capital. He seems highly organised on the bike but at times messy with tales of forgetting his shoes for a race. Pinot has been tipped by many in France. But French hopes come and go, see Romain Sicard. Pierre Rolland is one of the few to prove genuine although even he had a breakthrough several years ago, signed a fat contract… and vanished, only to reappear at the front of a race for the Tour de France. This pressure isn’t easy, right know you can see Jérôme Coppel wilting in front of the media as each day a camera is stuck in front of his face after the stage and he delivers a modest excuse for the relative underperformance. As well as physiology, Pinot’s mental strength is an asset in dealing with this. I’ve been tipping Pinot on here but it seems he’s on more significant radars. Listening to the Cycle Sport podcast during the Tour de France it seems it’s Team Sky’s manager Dave Brailsford is had noticed Pinot, hear for yourself after precisely 15 minutes. Excellent piece again. Did you have this pre-cooked or do you indeed write faster than some cyclists cycle? Do you expect something from Pinot in GC this year as well? Fun detail: Thibaut won the stage on his name day, July 8. It would be a shame to see this rider get lost on Sky playing a supporting role. French cycling needs him where he is. Nice piece, I would dearly love to see Pinot develop into a serious stage racer, especially with a team like FDJ. France needs a new big star but we have been here before. I’m wondering what the long-term future for Cavendish is at Sky. Is this years lack of support a blip or a sign of things to come? Arguably the lack of a lead out has cost him a shot at two stages this year. One where he crashed and the second where he was suffering its after effects. I like Team Sky and I like to see them successful but I also like seeing the best riders given the chance to win and such is the strength of the Sky roster at the moment that riders like EBH (who could have put together a good challenge for the green jersey) are reduced to domestiques for large portions of the race. In such teams it’s very difficult for talent to come through as the bar is set so high. The problem for Cav is probably where else could he go that would a) be able to support him, b) not have any GC ambitions in the same way that Sky do and c) be able to afford him. I guess Katusha if Menchov decides he can’t be bothered any more but it’s hard to see anywhere else unless a new team with cold hard cash and cold hard ambition appears from somewhere. That’s why Pinot is a far more interesting rider. Oh my smiley face didn’t show up. Cav knew what he was signing on to when he joined Sky and he knows exactly the support he’ll get at the Olympics, MSR, future Tours and the Giro. This just happens to be a year where the stars are aligning for Wiggins and the management would be foolish to not put other ambitions aside. Plus, he’s getting paid big money. I’ve always enjoyed Marc Madiot. A winner of multiple Paris Roubaixs and curator of some very interesting French riders, such as Frederic Guesdon. I hope Pinot is another chapter in the plucky story of FdJ. Thanks IR for putting together a nice piece. Anyways, this is a French/Pinot artible anyhow. It is a Pinot article and a part of that revolves around where he might go next. If he remains with FDJ will he reach the heights that he is capable of, if he moves to a bigger team will he get the opportunities he deserves. Sky currently have Wiggins, Froome, Uran, Porte and Henao who can be considered as GC contenders and it remains to be seen in what direction Peter Kennaugh develops. His performance at last years Tour of Poland augured well. There are only three grand tours and only one TdF. The French teams between them have the talent but individually are weak as they do not have the finances of other teams. Jeannesson looks promising so if Madiot can keep him and Pinot he perhaps has the bones of a squad that can compete. Poach Roland or Coppel and the team looks even better. For anyone who thinks that an up and coming French cyclist should stay in a French team, I have two words of advice: Sylvain Chavanel. True… but Chavanel was a classics rider on a French team with no culture of riding the classics. So he was sucked into riding the Tour. That team has changed sponsors and is Europcar today and they are a good bunch but in terms of sports science and rider support they are some way behind FDJ. Pinot by contrast is reasonably well-served at FDJ. I read the preview of this stage and remembered the mention of Pinot as a possible winner of the day and here he is. Nice work INRG. I’m now convinced that this is one of the best sites for some of the best analysis of what’s going in the pro peleton. Congratulations to Pinot for a nice victory. It should be interesting to see how things work out for him in the future. Marc Madiot – encouragement or bullying? It’s not the first time we’ve seen or heard Marc going mental at a rider. Just saying….